There are cool ways to risk your life. For example, being a firefighter, rescuing a wolf from a bear trap, or expressing an opinion on Twitter. Then there’s looking at your phone while crossing the street. That is decidedly not cool. Risky Phone (via RPS) is a free game about a thing a lot of people do, but probably shouldn’t. 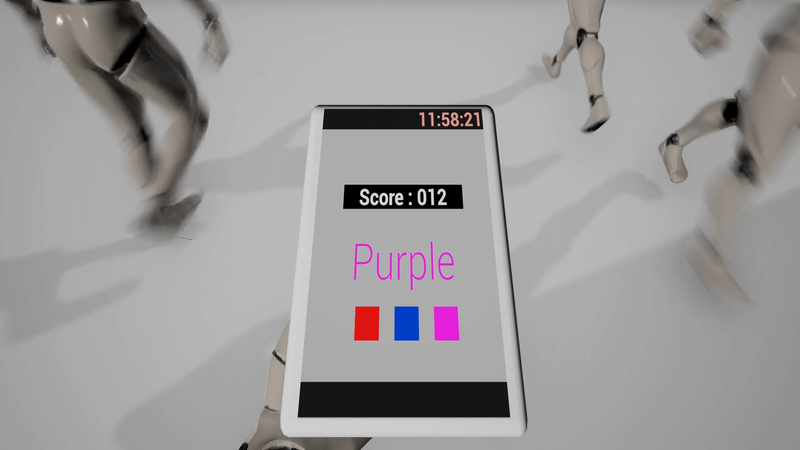 In it, you juggle scoring points in a simple color-matching game on your in-game phone while running to catch a train before it leaves the station. You’ve got to look out for other pedestrians and, of course, cars. While pedestrians will just knock you back, cars will send you soaring into the air in a hilarious jumble of limp limbs. Also, they’ll kill you. The first time I played, I kept my in-game head angled at my phone and plunged into traffic. It did not end well. When I started over, I kept glancing down at my phone and up at my surroundings. It was surprisingly difficult to continually do both! Risky Phone currently has one level, which you can replay to get a higher score by doing better in the phone game and reaching the end faster. It’s a clever little game about modern multitasking that I’d love to see expanded upon with more levels and ideas (have you ever tripped over a cat or dog while looking at your phone, because let me tell you, it’s a real hazard). For now, you can give the free version a try here.